Learn German in Munich at our partner school, BWS. Located in a great position in Munich, BWS is just a short walk from Munich's city centre and is located in a pretty, well-equipped building. The German language school is run by a team of friendly language professionals who encourage a relaxed atmosphere which ensures all German language students feel comfortable right away. If you would like to do the course consisting of 25 lessons, the 5 extra lessons are dedicated to improving conversation and involve communicative activities. The maximum number of students per class is 10 (12 in the summer). The minimum course length is 1 week. The minimum age to stay in a shared aparment is 20. The minimum age to stay in a single-use apartment is 18. 01/01/2019 to 06/01/2019, 19/04/2019, 22/04/2019, 01/05/2019, 30/05/2019, 10/06/2019, 20/06/2019, 15/08/2019, 03/10/2019, 01/11/2019, and from 23/12/2019 to 06/01/2020. There is no re-scheduling for classes missed due to these official holidays. The Mini Group course consists of 20 lessons per week in classes with a maximum of 6 students. The course is available from October to June. The combined German course in Munich combines the intensive course of 20 lessons per week with 5 or 10 private German lessons adapted to the student’s wants and needs. The commercial German course in Munich is especially designed for those who use this language at work. The aim of the course is to provide the participants with the essential language skills (spoken and written) for communication in German companies. 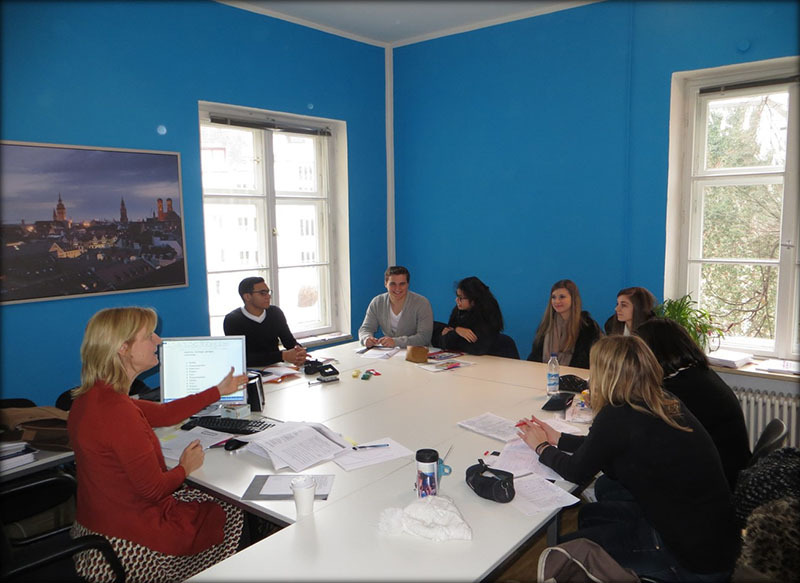 The individual German course in Munich involves private classes with a teacher designed to suit the student’s needs and wants, and they can choose what they want to study. The classes are adapted to the student’s language level. The course consists of 20 weekly lessons, but you can increase the number of hours by contacting the school. A shared apartment in Munich is an ideal accommodation option for those who want to practice their German with other students. It is possible to book single or double rooms. The bathroom, kitchen and living room are shared. The apartments are located at 15 to 25 minutes by public transportation to the school. A shared apartment Plus is a good self catering option where you can stay in a single or a twin room. You will share the kitchen and the bathroom with the other students from the school. Minimum age is 18 years. The apartments are at 15-25 minutes distance from the school by public transport. There is washing machine, a dish washer and wifi. The host family accommodation in Munich is the best way of practicing what you have learned in class and speaking German in real-life situations. The families offer double or single rooms with only accommodation or half board (breakfast and dinner). For those students who would like to live individually whilst they learn German in Munich, our partner German school offers the possibilty of staying in a single-use apartment with a private bathroom and kitchen.